TreeUtah’s mission is to improve Utah’s quality of life for present and future generations by enhancing the environment through tree planting, stewardship and education. In summer 2014, using funds from the Jordan River Foundation through a grant from the National Fish and Wildlife Foundation, TreeUtah hosted eleven Redwood Ranger Adventure Days (RRAD) experiences at the Redwood Nature Area, a 73-acre wetland habitat along the Jordan River Parkway. The 227 youth participants from Salt Lake County were engaged in place-based education activities to learn about this unique habitat through self-exploration and hands-on learning opportunities. The Redwood Ranger Adventure Days (RRAD) curriculum is based on Project Learning Tree activities and Utah state core standards, which engages students through enjoyable and educational activities. During the field trip, campers discussed what appropriate and respectful behavior in a natural space looks like to establish behavioral expectations. Campers participated in a nature scavenger hunt to practice using their observational skills, borrowed rubber boots, nets, and collection cups to discover aquatic microorganisms and learn about their ability to indicate the health of a system, and practiced nature journaling as they became familiar with local tree and plant species. Prior to participants’ departure, youth reflected on their experience and what they had learned. By the end of their day exploring the wetlands, youth gained a better understanding of the Jordan River Parkway, the organisms that live there, and how they can be stewards of the environment. The Kennecott Nature Center of Murray provides opportunities for thousands of children from Murray School District and selected Granite fourth-grade classes to enjoy observing and learning about nature through hands-on experiences and observations. 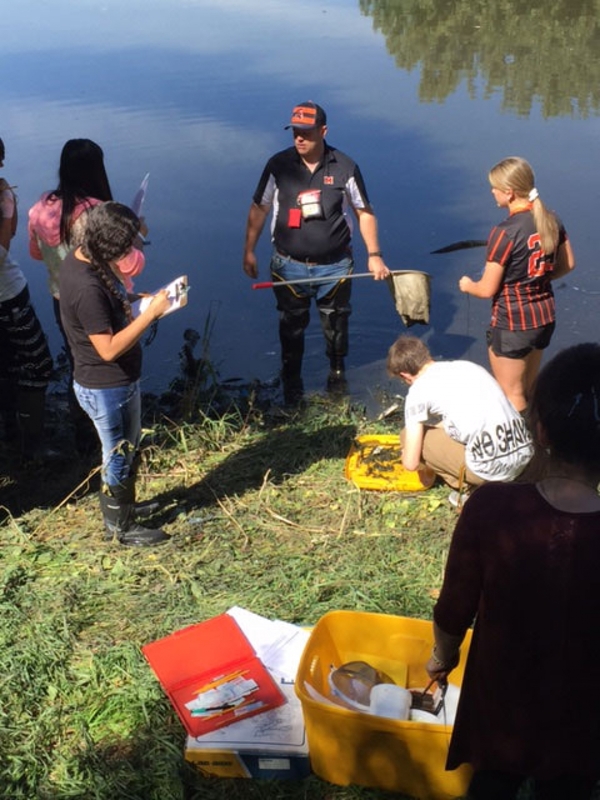 During 2015 the Jordan River Foundation, through a grant from the National Fish and Wildlife Foundation, afforded many opportunities for both Murray and Granite School District students to learn more about the Jordan River and the current efforts to restore its native flora and fauna. Since March, twenty-nine classes (totaling approximately 900 students) enjoyed studying at the River’s edge. Activities included collecting Jordan River water and examining it under microscopes, identifying native wetland plants and why they are of value to us, and studying bird adaptations and the need for urban open spaces to help them survive. Students truly love learning about and literally at the banks of the Jordan River. Its importance to our community is becoming meaningful to them.